Usb flash drives come in many different shapes and memory sizes and at C L Promotions we sell a large selection. So we have something for everyone. Our Promotional capsule usb drive comes with key ring loop and available in many memory sizes. Please ring 01989 780727 for more details. Plenty of room to support your business details and company logo to ensure that you stay advertised at all times. 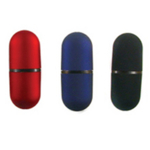 Other promotional and personalised items besides our Promotional capsule usb drive click here. To find out more about our Promotional capsule usb drive click here and fill in the contact form and we'll get straight back to you.